Welcome to The Puffin’s Nest! 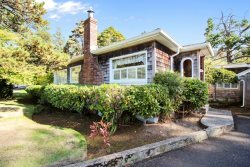 This warm and inviting three bedroom, two bath home is located just south of Haystack Rock in Cannon Beach. With only half a block between the house and the beach, The Puffin’s Nest is perfectly positioned to be the family beach retreat you’ve been looking for. You’ll know you’ve found the right home when you come upstairs to the large family living area (with the dining nook and kitchen as well ) where there’s plenty of space for everyone to gather and not feel crowded. Craving a breath of that salt air? Just step out onto the upper deck where you’ll smell that sea air and see the Pacific Ocean. There’s even a picnic table so you can have your lunch with a view! The first of the three bedrooms is on this floor. With south facing windows that will give you a peek of the ocean and a beautiful quilt to snuggle up with, you’ll feel right at home. One of the two bathrooms in the house is on this floor as well. Downstairs are the next two bedrooms, another bathroom and the laundry center. The first of the two bedrooms has a queen bed with another handmade quilt and south facing windows. The third bedroom is a very large open room with 4 twin beds – 2 of which are pushed together so they can be used as a king bed or twins. There is plenty of space for kids to a play area to themselves in this room! Just off the third bedroom is the lower deck. A perfect spot to catch a few rays, sneak a quiet moment, grab a good book, or take a little nap. The second of the two bathrooms is on this level along with the laundry center. The big surprise is on the lower level in the garage. Here’s where you’ll find sand toys for your trip to the beach and a ping pong table.